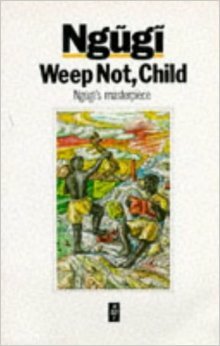 Weep Not Child is the debut novel of Kenyan writer Ngugi Wa Thiong’o. When the book was published it was the first by an African writer in the East Africa by the writer who was then known as James Ngugi. The protagonist in this story, the child being told to not weep is called Njoroge. He is the son of Ngotho a manager of a farm in the central Kenya and his second wife Nyokabi. He has a lot of brothers and sisters. Two of his brothers were involved in World War 2 and only Boro came back in one piece. Njoroge’s mother decides that her youngest son will get the white man’s education and sends him to school to his delight. He goes to school and starts doing well. While here he meets Mwihaki the daughter of Jacobo who is the local rich African who owns the land that the Ngotho family live in. She becomes one of his best friends in lower school. Seems idyllic no? Well it all goes very lousy very quickly. It starts to a downward spiral for the Ngotho family when the family patriarch loses his job when he takes part in the national strike. The strikers are hoping for higher wages from their employers. He also loses his home as his landlord kicks him out of his home and he has to seek shelter at a friend’s piece of land. Boro goes into the forest to join the resistance. The only bright lights in the family are Kamau the first son of Nyokabi who is a carpenter and our protagonist Njoroge the star student. Njoroge works hard at school believing that he will be the one to help his family when he does the reading thing all the way to England. It doesn’t work out quite that way. This book is… awesome! OK now that I have gotten that out of the way let’s look at this objectively. What I don’t love; character development is lacking which is easy to tell seeing as it’s the author’s first book. We only get a sense of Njoroge and his idealist belief that the white man’s education and religion is the key to getting him and his family out of the muck of the madness that is currently embroiling it. This book is rich on plot, not on characters. The beauty about the book though; it’s one of the best portrayal of the way that Kenyan villages were affected by our independence struggle. We see the dilemma of the residents of the country; the older ones who lost the land and hang onto myth in the hope that it will one day return represented by Ngotho. The brash and impatient young men who wanted it now, blamed the older ones for the the betrayal and went into the forest to fight represented by Boro. The young ones who just tried to roll with the blows and tries to ensure that they can feed their families represented by Kamau. The idealistic young man with the faith in the foreign ways in Njoroge. The traitorous rich, often given the derogatory term of Homeguard who benefit from the status quo and enforce it ruthlessly represented by Jacobo. The greedy settler who has the illness of the land and will go all lengths to ensure that he retains it, his god, represented by farmer turned District Commissioner Howlands. It is also a brilliant transition book. It shows how the world was before we all moved to the world we live in today that is dominated by the Western world that was nowhere in our conscience as a territory until the entry the white man a bit over a century and two decades ago. Think Chinua Achebe’s Things Fall Apart only now the white man has already taken over the land of the people. If there is one book that most clearly illustrates the life during the struggle in East Africa then this book Weep Not Child would probably be the best out there. The book celebrated its fiftieth year in print last year with numerous translations and if you can, try and pick it up as the people from EAEP celebrate the book and its author in June. When I read this book, I was quite young to know about character development and lack of the aforementioned depth, so I was deeply moved by it and even shed a few tears in contrary to the title that tells us, ‘weep not, child’. Thanks for the work, how can I get the comprehensive PDF summary? Google might have something for you.